It would be slightly misleading to call Edith Piaf one of the greatest torch singers of all time. Certainly this is how she has been received in the United States, and filmgoers will quickly recognize her as a model for Satine in Baz Lurman’s postmodern musical Moulin Rouge. And that takes us closer to the truth: la Môme Piaf was the real thing — the quintessentially French, quintessentially raw artistic genius, doomed by fate to live for and suffer through her art. Featuring a rich catalog of Piaf’s musical recordings, La Vie en Rose is a bioepic introducing the little sparrow of Paris to a new generation and hoping to breathe new life into what has become a dated, if not quite moribund musical tradition. The celebrated larger-than-life icon dubbed La Môme Piaf (“[the scrappy] kid sparrow”) was born Édith Giovanna Gassion in 1915 in Paris, and began life in the dicey and squalid immigrant district of Belleville (akin to London’s East End or Manhattan’s Lower East Side). Director and writer Dahan’s version reveals the inner Piaf, taking a highly subjective, if Cliff Notes-like highlights tour, moving backward and forward in time, focusing on key relationships and events that shaped her real life and public persona. Like her predecessors Marlene Dietrich and Jean Harlow, much of Piaf’s life remained enshrouded in mystery and mystification while she was alive. This film both clarifies and muddies those waters. 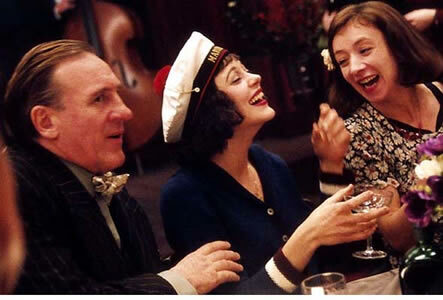 Actress Marion Cotillard (A Good Year) brings to life an astonishingly mesmerizing Piaf – she looks, she moves, she brawls and cajoles and wheedles and endears, and thoroughly convinces the audience she is Piaf. The camera lingers repeatedly on Piaf’s long, slim, bird’s feet, claw-like fingers. Piaf is rendered exactly as one would hope she would be – petite (4′ 8"), very slightly built, in true bohemian fashion consumptively sick all her life, and ballsy as only a Lumpenproletariat survivor can be. And when she opens her mouth to sing, a voice and a raw emotion the size of the Titanic comes thundering out, washing over and engulfing everyone in its path. From modest, even severe circumstances Piaf would ascend to international star of song, stage, and film. Several of her most famous songs came from the street cabaret tradition, a kind of French soul-blues, all pure emotions and pure French Cockney idiom. A Pygmalion-like patron eventually mentored her, trainikng her in classical singing techniques and stage presence, transforming her from a diamond in the rough to the icon that is remembered today. Piaf had the original “street cred,” and the inevitable comparisons to current hip-hop reveal the paucity of heart and soul of the latter. All the more then, that la chanteuse sings to us today with such an aching urgency and unfamiliar authenticity. Charming on-stage and before the public, Piaf was given increasingly to bouts of depression, rage, and binges. Dahan underscores Piaf’s life-long alcoholism and her serious addiction to morphine as consequences of her self-consuming ego. She was prescribed morphine as treatment following a serious car accident, and self-treated for worsening arthritis in her hands. The rest is history, though the camera’s infatuation with the long, massive medical needles Piaf used are scarier than most horror flick cgi props.